And gently held me in their quiet way. And let me cry and cry till I was done." "Stars" by Deborah Chandra, as read by Peter Negron, an 11-year-old who lost his father on 9/11. On behalf of all of us at VisionLink, we too add our thoughts and prayers for all of those whose lives were taken, and for the many who gave their lives responding. We are honored to have been asked to stand up two instances of the CommunityOS platform. The first was used by the Survivors’ Fund of The Community Foundation for the National Capital Region to support the families and friends of the victims at the Pentagon. Nearly $25 million was distributed by the Survivor's Fund. 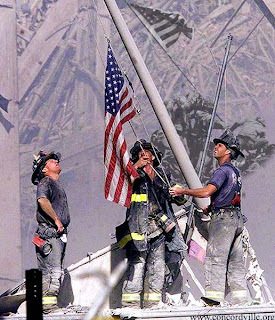 The second was for the New York Disaster Interfaith Service Network, and the 9/11 Recovery Worker Coordinated Assistance Network. It it an honor to be of assistance, and the lessons learned have been applied to the nation wide Coordinated Assistance Network, the VisionLink platform used by the American Red Cross, and for United Ways, FEMA and for the National Voluntary Organizations Active in Disaster. These efforts are united in common cause to weave the tapestry of successful community. May we never forget the lives lost, nor the unity gained.